I know, two garden reports in a row. But I could hardly go to a plant sale and not show off my new beauties. 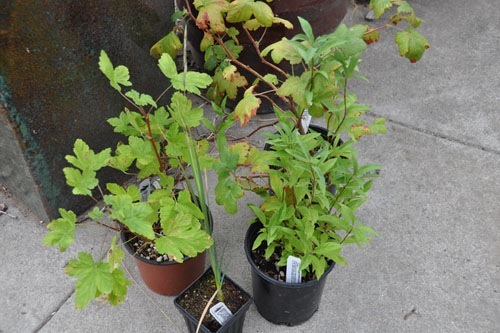 I got a couple of native gooseberries: Ribes nevadense and Ribes sanguine var. glutinous. And a native honeysuckle bush: Lonicera involucrata. Plus there is a plant in there that I already have, Dierama, because a neighbor liked it and buying a small pot of it was easier than dividing my beast. 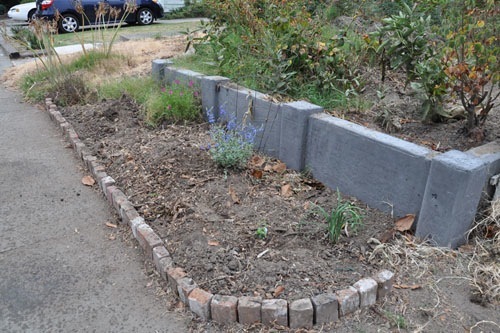 I immediately put some plants in the ground, because I had spots prepared for them. Way in the back there is Salvia 'Orchid Glow' (a patented variety), and halfway up is Salvia chamaedryoides. I also added another Douglas iris right by the path. Orchid Glow is really a stunner of a salvia. I usually avoid the patented varieties because they are generally more delicate, which is not a characteristic that works well in my garden. I may come to regret this, but right now it's a mighty fine looking flower. How fine? When we were in line to pay a hummingbird flew up and drank from it. Winner. 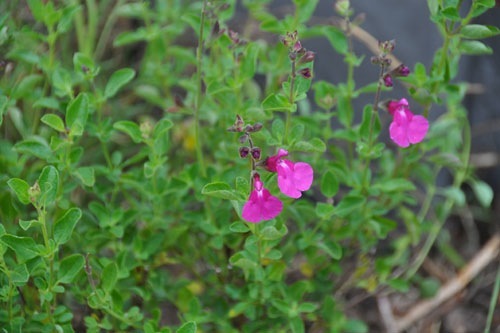 Salvia chamaedryoides is more my kind of salvia. 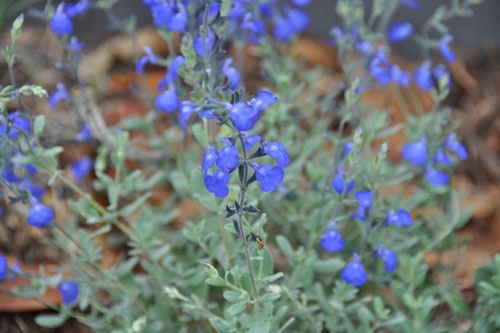 Amazing bright blue color (I'd originally intended to get a totally different bright blue salvia, but I liked the foliage on this one better), xeric, blooms all summer. It started raining as we were leaving the garden, and by the time we got home it was starting to get to Alameda. Nothing impressive, but enough that I figured I didn't need to water any of the new plants. It looks like winter just got here. I might have commented with this before, but I am in complete *awe* of how you can so much as think of a garden, much less keep such a productive and beautiful one, with all the work you're doing with the house. Thanks, Rae. My secret is to do a really bad job of finishing projects inside and out. I would have keeled right over with joy if a hummingbird had done that. They're a little more friendly around here, especially the Anna's who are here year-round. The ones who live near my garden often come down and sit on a branch near me to see what I am doing, or will hover right in front of my face chirruping at me. But yeah, pretty much everybody around lost their cool at the sight.